Following a problem of damp within a detached home in Lambeth we have now completed the essential damp roofing works. Following concerns over dampness brought to light by builders working on the property, Kenwood were called in inspect. We found rising damp to be affecting both the front and rear of the home. Due to higher external ground level at the rear of the home, Kenwoods have used a tanking system. Tanking is used to prevent moisture pushing through the brickwork. This is done in conjunction with the chemical damp proof course to rectify the rising damp. 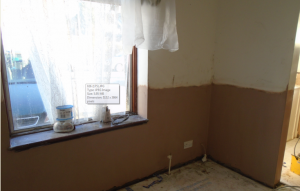 Rising damp is caused when there is a defect in physical damp proof course; this is placed within the walls when constructed. Over time this can crack or become damaged allowing ground moisture to ‘rise’ up. The walls have been re rendered and skim finished ready for redecoration.